Meet the Pioneer AVH-4100NEX – Forget best double din 2015, this model is quite possibly the best double din head unit EVER. Pioneer really hit a home run this year. I think it’s pretty safe to say the Pioneer AVH-4100NEX is the best double din head unit of 2015. Lately, it’s all I sell at the shop. Customers are initially attracted to this model based largely on the great cell phone integration features. This unit is flexible in that it supports both Apple CarPlay and Android Auto. As of this writing, no other brand offers a model that does both. Pioneer set it up in a pretty smart way. For two phone families (or the person who has an iPhone for personal use and Android for work), you can change a simple setting in the menu to switch between modes. Both devices can be connected at the same time as Apple users will connect to USB 1 and Android users will connect to USB 2. This unit is so jam packed with great, functional features. The only reason you’d want to move up in head unit is if you needed something with on board GPS. With Apple CarPlay and Android Auto, you can effectively turn this head unit into a GPS unit – assuming you have cell service. That’s the only downside to these features. If you drive into areas that lack cell service, you lose these Android Auto and Apple CarPlay features because they rely on a cellular data connection from your phone. Depending on where you live and drive, this may not be a concern. In our area, it’s not much of a concern for most. For the customers who really rely on GPS and drive into areas without cell service, they prefer to have on board GPS which works regardless of cell service. These folks usually step up to the AVIC-7100NEX or AVIC-8100NEX both of which have on board navigation in addition to Apple CarPlay and Android Auto. Most people are sold on this stereo once I plug their phone in and they see the awesome integration ability of Apple CarPlay or Android Auto. However, aside from these two very popular and convenient interfaces, the AVH-4100NEX actually has a lot more to offer. 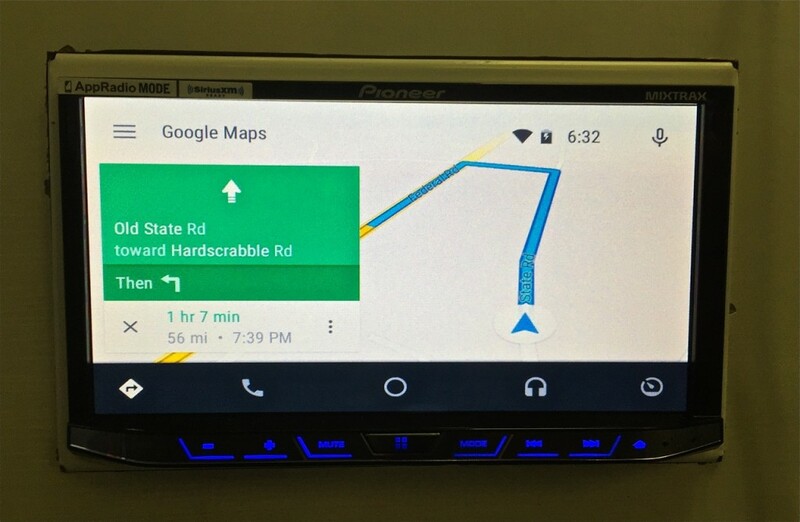 Disclaimer: Android Auto is supposed to work on all Android devices with Lollipop 5.0 and up, however I’ve had a few customers with Lollipop 5.0 where it was not yet functional including the Nexus 6 – I’m sure this will be resolved soon, but to really test functionality I recommend you try connecting your own phone in a showroom with a functional, up to date model. Apple CarPlay will only work with iPhone 5 and up. UPDATE 5/11/15 – Just tried with a customer’s Google Nexus 6 with Lollipop 5.1, worked no problem. That’s a resistive touch screen? Really? Yes, I’ve had tech savvy customers ask this upon first meeting the AVH-4100NEX because they can’t get over how bright and responsive the screen is. Although this is a resistive touch screen, it’s the best quality resistive touch screen I’ve seen (also used on all other 2015 NEX models except for the 8100 which uses a capacitive touch screen). It’s very bright, rich and responsive. It’s a huge improvement over last years models – not that they were bad, they’re just that much better. In fact, these new resistive touch screens are more responsive than the App Radio 4 which was released just last fall and features a capacitive touch screen. Sound quality and audio control features galore! So a few years ago I’d tell you Pioneer sounded like garbage and to never build a high fidelity audio system using a Pioneer double din. They were usually good with features, but they typically sounded muddy and lacked warmth, clarity, richness and detail. 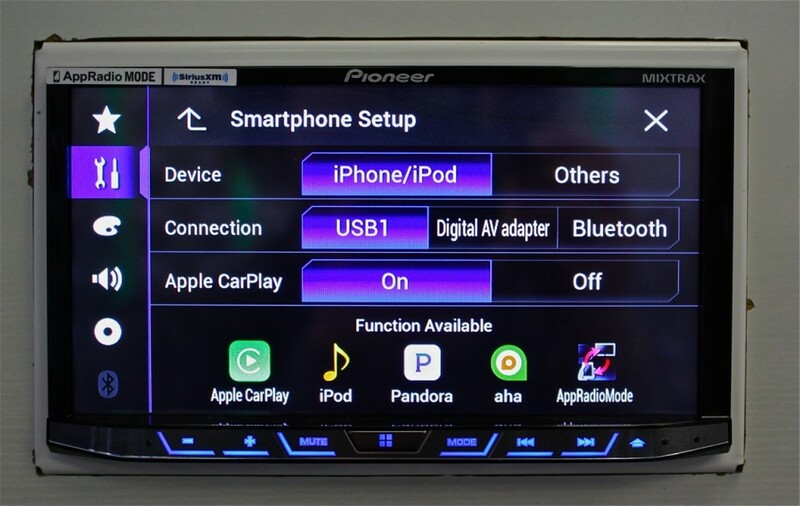 Thankfully, Pioneer really stepped up their game in the sound quality arena, most recently with their App Radio 4 and these sound quality features carry through to all the 2015 NEX models. I can’t say for sure that this unit sounds better than my Sony XAV-701HD. I have a feeling using an iPod or CD as a source, the Sony will still have the slight advantage. However, I’m sure the Pioneer will sound better playing FLAC audio files because – oh, yeah, it can play FLAC audio and guess what, my Sony can’t. The best double din head unit of 2015 includes a lot of convenient audio control features including a 13 band EQ. Digital time alignment – both a basic version and advanced. Listening position is time alignment for the less tech savvy. Built in crossovers for front, rear and subwoofer with slope adjustment. With all of these audio control tools along with a 4 volt pre-amp output and FLAC audio playback ability, the AVH-4100NEX can easily serve as the source in a high fidelity audio system. I think most consumers expect these features, but they are surprised to find out similar head units such as the App Radio 4 or Alpine iLX-007 lack some of these options. If you want Apple CarPlay and SiriusXM this is where it starts. Both Pioneer’s App Radio 4 and Alpine’s iLX-007 are not SiriusXM ready. Although I don’t care for SiriusXM, some people have to have it. The aforementioned models also lack a CD player. Not a deal breaker for most, but sometimes you want to keep your options open. And that’s really what this head unit does. I can’t think of anything it lacks other than on board GPS and if you need on board GPS, check out the AVIC-7100NEX or AVIC-8100NEX. It’s one of the very few quality double din heads I’ve come across that has a detachable face. I think this thing belongs in my Jeep because of that feature alone. It’s all these little features that add up to make this such a great head unit. Unlike Alpine’s iLX-007, if you don’t feel like connecting your cell phone through the USB port, this model does have Bluetooth for both handsfree calling and audio streaming. You just can’t use Apple CarPlay or Android Auto unless you’re connected. However, Android users will not be able to select Pandora when connected through USB 2 in this mode. I believe this is due to the Android Auto software interfering with Pandora. Once Android Auto is launched it locks the phone out so you must control everything from the stereo. The idea behind this is to get you to stop playing with your phone while you’re driving and rely more on voice control. Well, that’s great, except Pandora isn’t an Android Auto compatible app so it leaves you no way to launch the app. Depending on what Android device you have, you may simply have to disconnect your phone from USB 2 in order to launch Pandora OR you may have to go back into the Smartphone Setup and switch Android Auto to Off or switch the Connection type to Bluetooth. 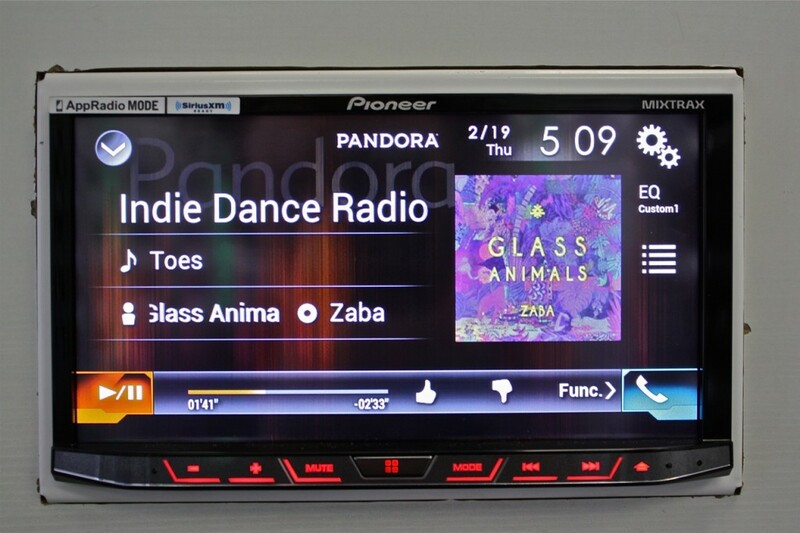 A bit of a pain in the arse right now, but something I think Pioneer, Pandora and Android Auto are working out. This is only an issue for Android users, Pandora doesn’t have any hiccups for iPhone and Apple CarPlay users. Although this may seem like a frivolous feature to some, the ability to customize and personalize the display is important – to me and to a lot of consumers. Matching the display to your vehicle’s interior is a perk that makes this double din head unit even more desirable. 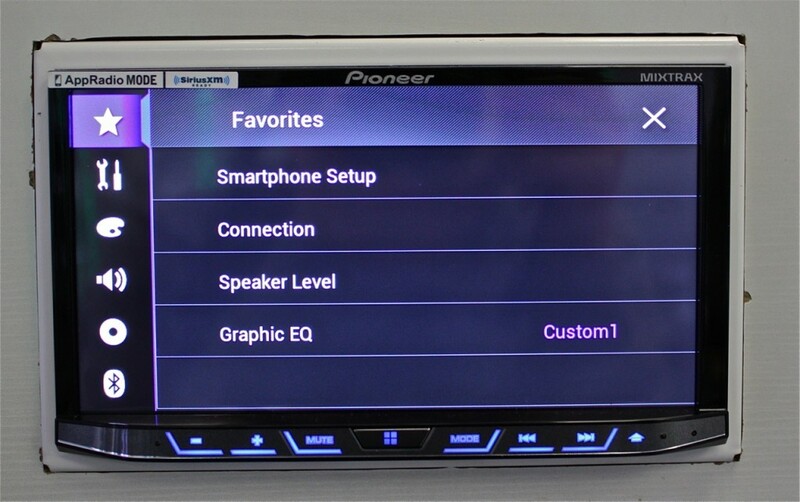 The Pioneer AVH-4100NEX has a very flexible and customizable display menu. Users can select from several illumination options or go into the custom color menu to fine tune a button color. Additionally, they can select from several different color themes for the main menu as well as select from several different background images (or upload your own). You can also populate the home page with your favorite and most commonly used sources. It’s really easy to do. Drag and drop to the top bar and you’re done. 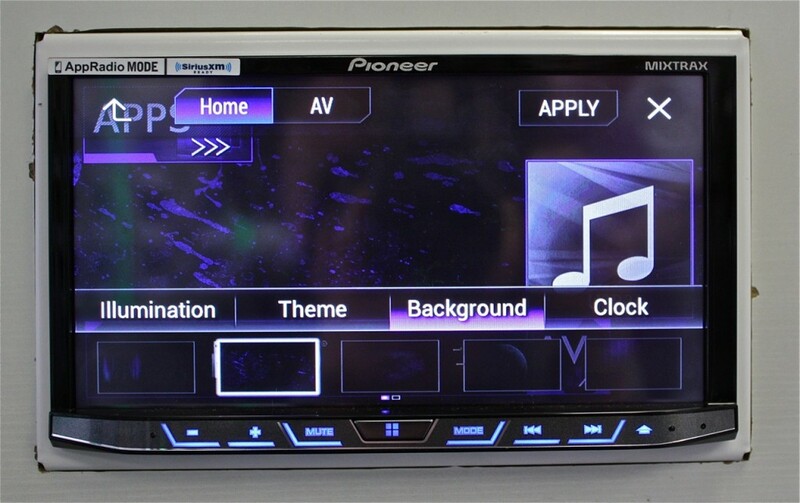 Unless you need on board navigation, you should visit a shop that carries it and take the Pioneer AVH-4100NEX out for a spin. It’s something you really should see in person and try with your own phone so you can get a feel for how it works. Until Kenwood releases their long awaited Apple CarPlay/Android Auto DDX9902s and DDX9702s or Parrots releases their RNB6, I think it’s safe to say the Pioneer AVH-4100NEX has the lead for best double din head unit 2015. PAC TR7 – Read this install tip from PAC Audio. The tech tip is required if you plan on using the HDMI input, A/V input or DVD function. TR7 is required either way. USB-CBL – Flush Mount USB Port – the head unit only comes with one USB extension cable so it’s a good idea to grab one or two of these for flush mounting and routing USB1 and USB2. HDMI and USB Flush Mount Port – Convenient if planning of accessing video content from a phone. Will need phone specific adapter. IS335 – in case you want to use the rear auxiliary input, allows you to flush mount an AUX port. I like your reviews and how great you are at responding to users questions. I was wondering how well the mic works on the 4200nex? My 2009 kia optima isnt the most quite cabin so where would be the best place to place the mic in that car? Very well, if anything sometimes I just have to turn the mic gain down for people (usually for iPhone users). I find it’s best to get it close to the driver away from the glass – typically either right in the speedometer cluster area or sometimes on the dash between the steering wheel and the radio. My wife has a 2016 Jeep Wrangler Unlimited – Freedom (Oscar Mike) edition. This Jeep has the Alpine speakers with the weather proof sub woofer mounted in the back floor, steering wheel controls, blue tooth, and Sirius/XM – but it has the basic “radio 130″ head unit. I’m planning on buying the Pioneer AVH-4100NEX for her (wedding anniversary gift). I’ve watched the videos, and it looks really easy to pull the dash panel off and swap the head units. What I’m concerned about is will the AVH-4100NEX be plug and play? Or is there some sort of installation kit I will need? I don’t want to get the stereo, pull the dash apart, and then find out I need some adapters – that would ruin my wife’s surprise! Thanks in advance for your help! So yeah, not exactly plug and play, but very nice when it’s all said and done. We charge about 2.5 hours labor for the full install and we do this every day so give yourself plenty of time if you’re going to tackle it yourself. I hope that helps! Hi Annie. Thank you for the awesome knowledge you share. 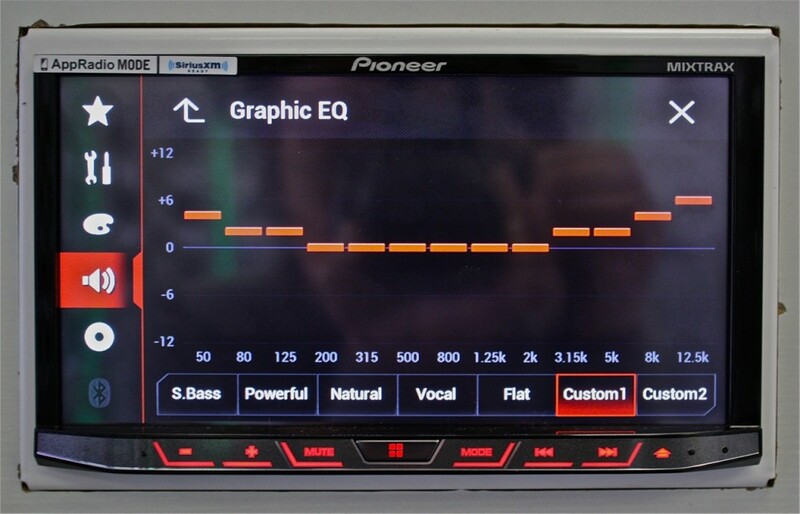 US there a “best’ double din audio system that you recommend for 2016? Is there an updated review coming up? I have a Prius anf want to update the stock head unit for better Hugh quality audio. Hi Sohail – yes it’s on my to do list, I really hope to get it out this month. There are pro’s and con’s to both, but I’m between the AVH-4200NEX and Kenwood DDX9703s/9903s. Annie – You ROCK! Thanks for all your time and insight based upon your experience. First, what is the best “module(s) to use in my truck when replacing the head unit and still have the option to use the SWCs. Bose amp, and on-star? I see the iDatalink Maestro compatibility marketed all over the place with the major HU manufacturers, but what does that really mean? Does the iDatalink Maestro do things that the PAC, Axxess, etc won’t do since they don’t have a partnership with Pioneer? I don’t mind spending a little more money on something that is higher quality, easier to install and/or provides extra functionality that is useful. With that being said, what would you recommend for my truck for the wiring related modules, based upon your experience? Regarding a new HU, I want something with CarPlay. I have been very close to ordering an Appradio 4, but just keep wondering if/when Pioneer might release the next version, and might it go back to the 7″ screen, which I greatly prefer. I also love the capacitive screen since it is more like the iPhone. I have hit the pause button on this purchase after running across your 4100NEX review and the Q&A above. I do agree with you that the 4100/4200 provide more value with many more options as compared to the Appradio 4. I don’t place too much importance on the CD/DVD option as I find myself listening to the music on my iPhone. So now I lean towards your professional recommendation of the 4100 or 4200, but I wonder if there are any rumors from historically accurate sources that would suggest a timeframe on this release? What are your thoughts on this? Thanks in advance for your time and feedback. I really appreciate it. Yeah, I would suggest the AVH-4200NEX and the iDatalink Maestro. The iDatalink Maestro basically communicates better with your vehicle than the PAC audio or Axxess interfaces and the AVH-4200NEX has more advanced communication with the iDatalnk Maestro than last year’s AVH-4100NEX (that’s what it means when you see “iDatalink serial port connection” as a feature on the radio – that usually indicates it communicates with multiple CAN bus networks in the vehicle, usually high speed and low speed CAN bus whereas the other interfaces only communicate with one set of CAN bus communication wires, low speed CAN bus and this have less features/integration). 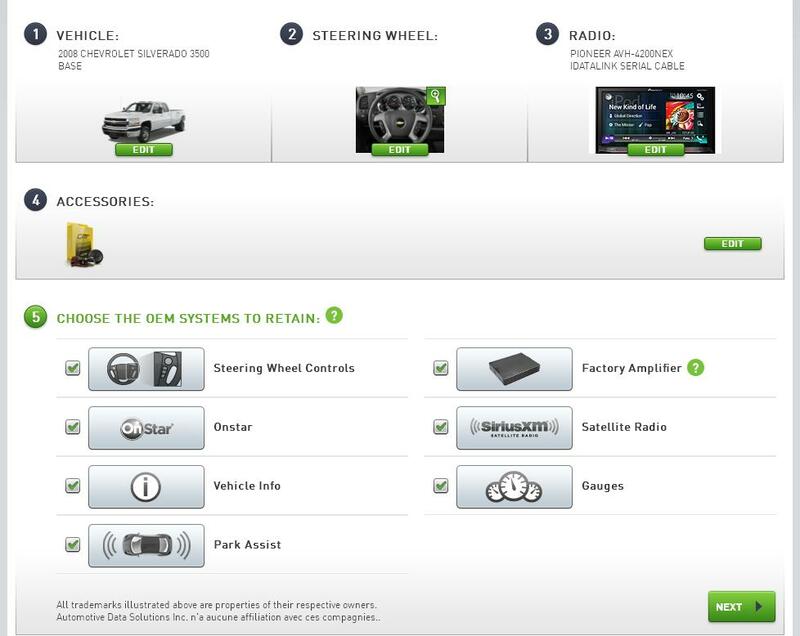 I just ran a simulation on the iDatalink website so you can see what features can be retained from your OEM system. Pretty cool, right? And yes, there will be an App Radio 5 soon – probably late summer is my guess. And the new one will also have the advanced iDatalink communication feature, the current App Radio 4 does not. Vehicle info means things like check/reset check engine codes/error codes, tire pressure monitoring, door ajar, etc. I hope that helps! 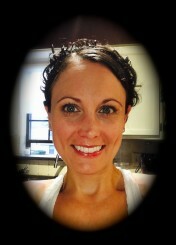 I have read all of your reviews and comments over the past year just now, and I am impressed !! 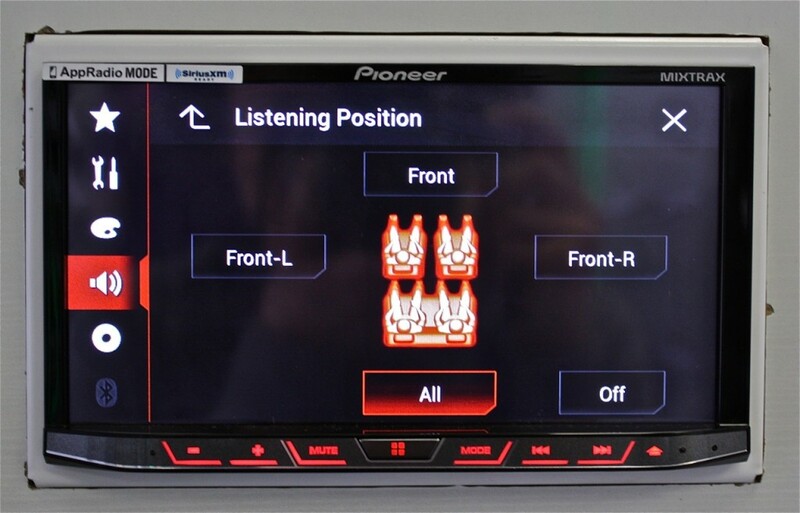 But I have a question, I have a Ford F150 with an aftermarket double din deck already….. what I am missing is good fluid control of my iphone 6 and I have been looking at the Pioneer AppRadio 4 SPH-DA120 and almost ready to just buy it, but before I do I would love to get your feedback and recommendation. So I am a huge fan of siri, use it for everything from opening my pandora, to responding to a text, to getting gps directions, to adding reminders and alerts….. I have a great lighting dock installed along side my dash that charges and holds my iphone 6 perfectly, but now i want a good double din unit that can integrate into everything that siri can do for me…..
soooooo, is the app radio 4 the best option out there ? or do you have other more affordable options that would fit me better ? Now, you didn’t say what year your F-150 is so iDatalink Maestro compatibility may or may not be a feature of importance to you. Both the AVH-4100NEX and this year’s AVH-4200NEX are iDatalink Maestro compatible. This year’s AVH-4200NEX has more advanced iDatalink Maestro integration features. Depending on the year of your vehicle, this means you may be able to access vehicle information on screen such as tire pressure monitoring, read/reset check engine/error codes, that kind of stuff. But that’s really only an option on newer vehicles that communicate this info on the CAN Bus circuit. You can check compatibility here and just select to the right where it says “Start Weblink Demo”. Annie, You are AWESOME. Very few understand and can easily explain this stuff the way you can. Looking for CarPlay and best sound quality. Have watched yours and every other video review. Discovered there are two different CarPlay implementations. One supports inertial scrolling. One does not. Pioneer AppRadio 4, 8100 and all Kenwoods do. Alpine ILX-007 and rest of Pioneers do not. Why does it matter? I played with an Alpine and AppRadio 4 side by side – lack of inertial scrolling on the Alpine made it much more difficult to scroll through lists of artists for example. More often than not, I accidentally selected an artist instead of scrolling through the list. Got very frustrating very quickly. Don’t think I can live with that. I know you love the 4100NEX and I read your lukewarm comments about the Kenwoods. The new 9903s will have 5V preamps and a capacitive touch screen. Trying to balance that with the downsides you point out and wonder if I can be happy with the non-inertial scrolling 4100 (or more likely 4200). Any additional words of advice over and above what you’ve already provided on this awesome website? Thanks and thanks for taking the time to put all of this info up for us! Thank you for the kind words and comment! I agree I like the scrolling capacity of the App Radio 4 and 8100 and the resistive touch screen would be the one thing I would change if I could on the 4100. I actually sell quite a few App Radio 4’s too because many customers prefer that style screen responsive and appearance. I do like the higher voltage preout on the Kenwood and I am looking forward to the new Kenwood too – I just have such a hang up with the little details that it seems Kenwood engineers just totally overlook. For example, on the DDX9902s and DDX9702s, you can’t just plug in an iPod and play it. You have to turn off CarPlay in the settings menu in order to play an iPod. WTF? What if you have an iPod classic and an iPhone and want to be able to switch between both? I just found that out the other day when we installed a DDX9902s and we ended up pulling it out later that afternoon and put in the AVH-4100 which has two USB ports (what a concept!). So I hope the 9903s is more user friendly than previous Kenwood models and has more well thought out settings, because the higher voltage pre-out does make a sound quality difference. On paper, it looks like it will be awesome. We will see. Thanks for the comments back. Curiously, inertial scrolling doesn’t seem tied to capacitive touch. Alpine ILX-007 is capacitive but not inertial. None of the Kenwoods are capacitive but all are inertial. 8100 is both capacitive and inertial. Maybe it’s the speed/capacity of the graphics processor? No clue. But strangely enough, it does not support inertial scrolling! Why would they do that? Deal breaker for me – will wait for the new Kenwoods to show up. I am thinking of installing a 2Din system in my travel trailer. If you have ever seen how horrible and outdated RV ‘entertainment” systems are – you would be horrified. All that tech is 10 years behind. I think a 2Din video system can do the trick. I would need it to connect to a flat screen tv (play DVDs) and hopefully be able to also stream video to the TV (via phone or ipad) and also be able to run at least 2 sound zones (outside / inside). Im not sure if the new HDMI connections on these units will make it all possible. Yes, I like the Pioneer models for this and have actually done a couple in RV’s. They do have the option to do dual zone as well. Just keep in mind the HDMI on these radios is an input on the unit, not an output. However all the Pioneer double dins with HDMI also have a standard audio video output (RCA style) which is what can be utilized for the dual zone purpose. When running dual zone, audio on the main unit will only be routed to “front speakers”. Audio on the other zone being utilized would be routed to the “rear speakers”. It may be helpful to check out the install guide of whatever radio you are considering so you can map it out accordingly and confirm it has all the necessary inputs and outputs for your particular set up. You could use the HDMI input to route A/V from an iPad, but you will also need an apple lightning to digital A/V adapter to do that. At the moment I am not aware of any audio/video streaming devices for car audio that are compatible with Apple products for Airplay. Hi I have this headunit and I am not sure if you have experienced this but when I drive over a bump or a rough road there is a slight vibration/noise of the head unit and I think it has something to do with the detachable face as if I drive with the unit in the eject position there is no vibration. Hi Robert – my guess is you’re hearing something in the dash kit vibrating and when the face is open it’s applying pressure to the lower portion of the dash kit eliminating the vibration. I would take it part and see if adding some foam tape for pressure in that same area of the dash kit eliminates the issue. 1- for the remotes (blue power signal) on the kenwood sub and alpine amp (I am running separate power for each straight to battery)- do I just connect to remote to 4100? Think this is my biggest obstacle. Where and how am I running these? 2- back up camera (Esky EC170-06)- I know the input on the 4100 is the brown video line. What RCA’s do you run to these units and where do you pull the power from? 3- anything you would recommend problem wise that I may run into. I plan on soldering and wiring all this up at home before going to the Jeep. There aren’t any reputable installers in my area that I trust touching my Jeep or I would pay to have it done. Thanks for your time! You’ll be tying in a couple of the remote turn on leads to the Pioneer deck. Usually we use solid blue from the amps to the remote turn on off the Pioneer which is blue with white stripe. Also the bypass module will need to be connected to that too. Pretty sure the RP4-CH11 gives you the reverse trigger for the Pioneer, yeah it does, see here. Camera’s – well the ones I use and sell come with the necessary video cable. If the camera you’re using doesn’t come with a video cable, Stinger sells those separately such as the SI4817. Typically pull power from that same reverse lead shown in the Pac interface install guide. Extremely helpful. Thank you for the detailed information. I wanted to add to your response to Gil. I did the same compare and also didn’t see much. So, I contacted Pioneer support. The response I received was “The most notable difference is that the newer AVH-4200NEX adds Spotify compatibility and discontinues Mirror Link and aha radio compatibility.” Hope this helps! I did recently hear hat there is also more advanced iDatalink integration for the new 2016 models so if you have a vehicle that is compatible with the iDatalink Maestro steering wheel control module, this may be a tipping point to go with the newer model instead. Thanks for your write up. I am ready to pull the trigger on a 4100NEX. Have you heard any details on the new 4200NEX? What would you recommend getting at this time? I have not, I did try the quick little compare button on their website (check off both the 4100NEX and 4200NEX then hit Compare), but didn’t see anything major stick out at me – Aha radio compatibility and Mirrorlink which I never had any luck with. I didn’t get a chance to go to CES this year so I’m still waiting to attend product training which usually happens in the Spring. I’ve seen the AVEC-5100NEX priced lower than the 4100. Am I missing something? If I’m a strictly Apple only guy, is there any reason NOT to get the 5100 instead? I know that the faceplate is not detachable, but I’m honestly never going to want to carry around a dead 6″ screen anyway. It actually is detachable (just a small portion of it on the left – the buttons). Major differences between the 5100NEX and the 4100NEX is the 5100NEX includes on board nav (and Apple CarPlay), but has a slightly smaller screen and it lacks HDMI input, SD Card, Android Auto and HD Radio. I do sell quite a few of these to dedicated Apple customers. Just came across your site recently, and appreciate your well-written, detailed reviews! I’m trying to switch out the base unit on my 2014 Subaru Forester for a car-play capable unit. I always plug-in for charging (so bluetooth isn’t a necessity), and am really only needing it for it’s Car Play and AM/FM capability. I was set leaning towards the Alpine iLX-007 due to its bigger screen and Apple-like simplicity. However, it looks like this may be a good decision as well. Which would you prefer between the two based on what the needs are? Thanks again! Screen size is the same between the AVH-4100NEX and iLX-007. I do like the capacitive touch screen of the Alpine, but hate the limited features of the unit. I feel like the Pioneer is a better value – you get more for your money. Totally a personal choice though, they’re both good units. I like the Pioneer better personally for value, ease of use and flexibility, but I do like the screen of the Alpine better. The App Radio 4 is another nice contender because then you get the nice capacitive touch screen and added features, but then it’s a slightly smaller screen with the controls to the left. I have a F250 that I want to put the 4100 in but need multiple video inputs. I would like a reverse camera, hitch camera, and a camera in front. I would actually like the cameras to be visible whenever i wanted versus only when the truck is in reverse. Is there a configuration with this head unit where I could accomplish this setup? Hi Brian, you can do two camera inputs – one for front and one for rear and you could view either at any time, but I got nothing for 3 cameras. Perhaps a solution (which I’ve done before for a customer) is a multiview rear camera that has it’s own separate switch that will allow you choose between several views of the rear camera. Hi Robert, I haven’t had that complaint from any of my Android Auto customers, but honestly I sometimes have that quirk myself with my iPhone on our showroom display with a variety of head units, CarPlay or otherwise. I think it may be a timing thing because usually all I have to do is disconnect and reconnect and it’s recognized by whatever head unit I’m using at the time. Is it necessary to install an amplifier with a NEX 8000? Just installed a NEX 8000 on my 2006 Acura MDX sounds better than factory radio but not enough buff I was looking forward to. Please advice. If you’re looking for better sound and more output I would recommend upgrading your speakers and installing a new higher power amplifier for those – I would not recommend amplify the stock speakers, however. Thank you for your details answer. you are so professional! Another concern I have in mind before choose the right system for my car is if the carplay really worth the money? As I understand, a system with carplay cost almost double compare to others without carplay but in the same level. Hi Yehuda – in terms of double din non CarPlay – there is a sound quality difference say between the AVH-4100NEX and the AVH-5700BHS (or 3700, 2700, etc). The Pioneer App Radio 4 and all their NEX models do use a better quality digital to analog converter and do have better sound quality over their other double din touch screen non CarPlay units. They are also faster in processing and loading information from an iPod or USB drive. 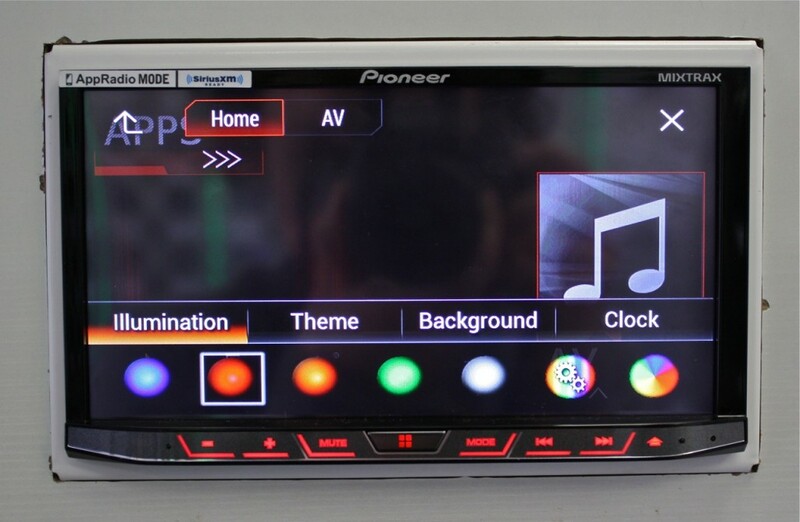 For a less expensive, non CarPlay model, the Pioneer AVH-2700BS (soon to be replaced by the AVH-2800BS) has been a very popular model at our shop. Keep in mind it’s not just CarPlay that brings up the price. Faster processing and better sound quality too. I think it’s worth it. I sell a lot of these 4100’s and have had a lot of happy customers. Once they see it in action, they’re hooked and have no problem spending the extra dough. Hi Dave – the 4100 lacks onboard navigation so if navigation is a key feature I would go with the 8100. Both have CarPlay and Android Auto, but if you’re ever in an area without good cell service (or you don’t feel like using your data plan), you would have the onboard navigation which tracks like 12 different satellites and doesn’t rely on cell service. I hope that helps! I just wondering if the AVH-4100NEX can fit into my Chevrolet Captiva 2009 car? Also, what about European radio tuning? Yeah that looks like what we call a Chevrolet Equinox. You’ll need a kit, a special harness and antenna adapter. For the radio interface harness, we usually use PAC Audio. Depending on exactly what stock features you have like Bose, Onstar (even if you’re not using it), steering wheel controls, stock rear seat DVD player, etc. it will be one version or another. I recommend checking their application guide and just put in 2009 Chevrolet Equinox. Another question I have is how is the DDX9702S compare to the AVH-4100NEX? I am an iphone user and most likely will use the carplay, but are there any other functions beside the carplay that make the difference between these two? I recently cut ties with Kenwood for a variety of reasons. I had plans to get a DDX9702S or DDX9902s in here anyways just to check it out, but unfortunately I have more ideas and things I want to do than time in the day. I did get to check it out in person at CES and I wasn’t over the moon about it because it was basically like last years DDX8901 which was just an okay unit for me. The DDX8901 was a great sounding unit, but had poor picture quality and confusing user interface, extensive menus. Here’s what I tell my customers. If you want sound quality – forget CarPlay all together and go with Sony. The XAV-712HD has the best sound of all of them in my opinion (vs Kenwood, Alpine, Pioneer). 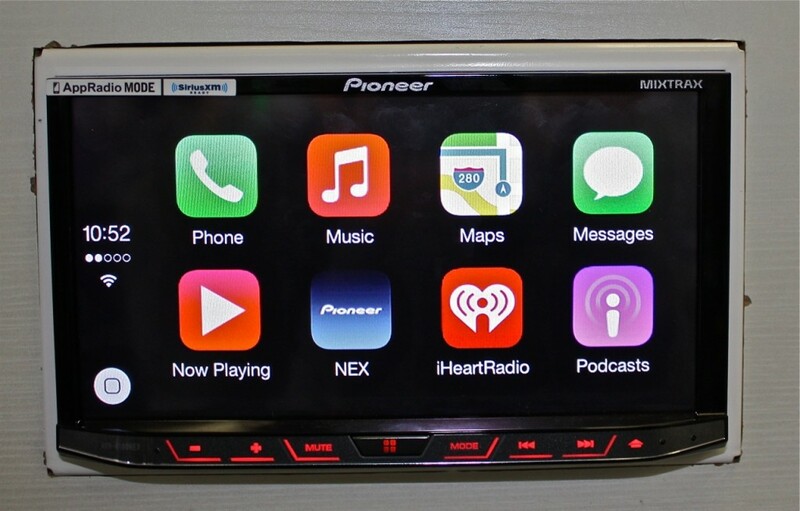 If you want CarPlay, go with the Pioneer AVH-4100NEX. Easy to use, bright screen, works well and it does sound good. It’s not the same audio processor Pioneer has used in the past. The sound quality is indiscernible between the Alpine iLX-007 and the Pioneer NEX models. The Kenwood may have a slight edge in sound quality, but it comes with quirks. And either way, if sound quality is main concern, better off with Sony anyways. I had a lot of product quality issues with Kenwood and the biggest thing was the feedback from customers. Most of the customers I have sold Kenwood to have hated how difficult they are to use. Not all of them, but most of them. And when you are in customer service for a living, you kind of get tired of hearing that and tend to stop selling the products that cause difficulties. Does this unit support that? I believe in Australia they call this model the AVH-X8750BT. There should be a dealer locator or where to buy link somewhere on Pioneer’s website. Cheers! I was fascinated by your review of the 4100NEX. I recently had one installed in my wife’s H2. The installer couldn’t get it exactly level to the dash, but It looks and sounds great! It’s also easy to use for those who don’t want to invest a lot of time in setup. 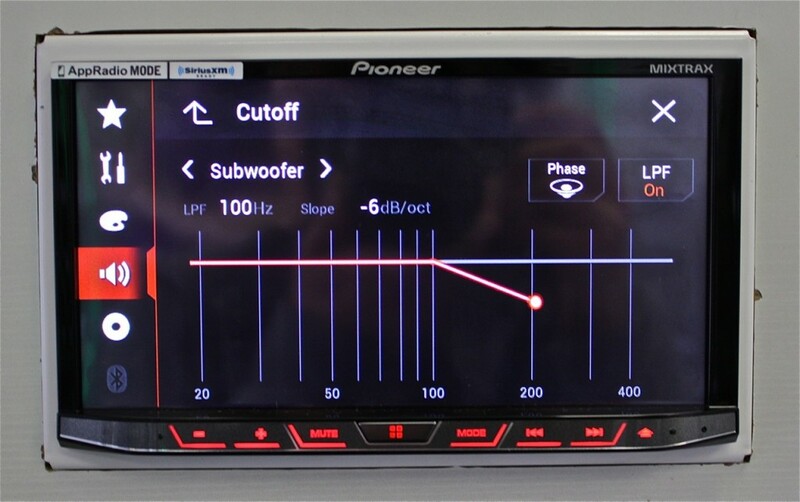 I have a 2015 Jeep Wrangler Unlimited and I’m considering replacing the U730N deck with the Pioneer. While the graphics on the OE unit leave something to be desired, my main issue is with the voice recognition while using the NAV. I’d like to know if you have any specific recommendations or considerations for the Pioneer unit installation in the Jeep. I currently have the Galaxy S6 and want to continue to have access to the steering controls. It would be great to have voice recognition, but I’m not certain how it would work with Carplay. I was also told by the installer that they might not be able to connect the factory Jeep microphone to the unit. This is concerning me because the mic placement in the H2 was somewhat of a challenge. Any suggestions you can offer will be appreciated. Thank you! Hey Ray – Jeeps are so easy to work on! You will want to use the mic that comes with the Pioneer, you can actually just pop out the stock U-connect microphone and clip the Pioneer there if you want to keep in stock location (What we did in our Jeep), but normally I like to get the mic closer to the driver and away from wind noise. Sometimes we’ll mount it right on top of the tray above the stereo closer to the driver side aimed at you. It’s pretty small and discreet so I wouldn’t worry about it. You’ll want to use the iDatalink Maestro for best steering wheel integration and yes you can re-use the stock voice button to prompt either Siri or Google Voice depending on which mode you are in on the head unit. In case you didn’t see it, here’s a write up on one we did recently. I went through two Pioneer AVH4100s. The unit is great for certain people but not others. I had no issues with Android Auto; it worked great with my S6 Edge. In theory, two USBs is perfect. However, the Apple USB will only work with iPod Touch or iPhone. With iPod Classic 160, or any earlier iPods with the 30 pin connector, you’ll get intermittent static during playback. For someone like me, who prioritizes music and sound quality over everything else, that’s a dealbreaker. If you have a Lightning connection you are fine. If your iPod is a 30 pin, well, you are screwed. I was basically told to spend $400 on a new iPod touch that has features I don’t want and less storage space. I’ve gone to Kenwood, which though it doesn’t have the same options at least plays iPods. For anyone wondering, the ddx9902s does indeed have inertial scrolling and pinch to zoom (with a resistive touch screen display, as well). I have one installed in my ’15 Camaro 1LE. Tough choice between it and the 4100. Great article. I had been looking at this model for my 2010 Jetta TDI which just up and died this week. You’re in depth review pretty much nailed it for me. The question I have is about the conversion from the RCD510 premium from the factory. Will I get full functionality of the steering wheel, satellite radio, the aux input and IPod inputs built in? Hi Larry – glad I could help! You just need some parts. I recommend the iDatalink Maestro RR steering wheel control interface and the necessary VW1 harness to go with it. When using the Maestro RR I believe there is an option to retain the stock media function (aux/ipod), but I’m not positive, I’d have to do a test flash simulation and see what options come up. Normally we just flush mount the USB ports in the factory blanks that are usually right in front of the shifter below the stereo in front of that little cubby. You won’t be able to keep the stock sat tuner in the VW, but I think you can re-use the stock antenna using the SAT1 adapter and SXV300 tuner. I’m doing a 2009 VW CC in 10 days and just went over all this stuff yesterday so still kind of fresh in my mind, but it may be slightly different in the Jetta. The only thing that I don’t think will work is preset up and down from the steering wheel controls, I believe that’s on the right hand side of the steering wheel, but everything on the left should work. Volume, track up/down, answer/end call, voice control, source. Very useful article – thanks. Question: I have a new 2015 Jeep Wrangler. My main gripe, as far as the audio system goes, is that I cannot screen-share from my Android phone onto the car’s system. The built-in sat nav is pathetically out of date and I prefer to use either Tom Tom or Sygic. I would also prefer to use the Android music player (Poweramp) and see it and control it via the car’s screen. Is it possible to do this and have full use of the steering wheel controls with the Pioneer unit you describe? Many thanks. David. Well the Android Auto interface will allow you to access select apps and control from the screen – Google Maps, Google Play Music, Spotify, iHeart, Tunein and they’re adding more and more as time goes on. You absolutely can retain the steering wheel controls and for the Jeep I would recommend the iDatalink Maestro RR. Thanks for your reply Annie. The product you mention looks interesting. Best wishes from NSW, Oz. Great post! 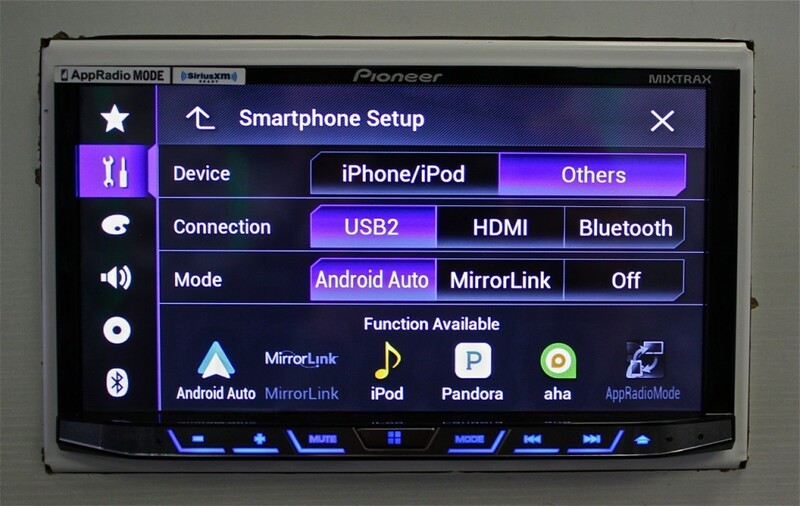 Im currently shopping for a double din HU w/ flac & mp4 support. My main concern is sound quality. Currently I have a system with all the new focal flax products. My question is deciding on the HU. The audio shop I attend says and I quote “NO pioneers, they have bad ground noise problems” & “Pioneer use to be our premier dealer, they never take care of there warranty issues, very bad customer service and horrible ground loop issues” I’m not sure if this shop is holding a grudge but in my eyes the pioneer HU you speak about seems perfect for me, what is your opinion on this matter?. Also the shop manager keeps recommending the Kenwood 772 but the price is just ridiculous right now but sometimes Kenwood puts their products on sale. So should I wait patiently for a sale or buy this pioneer? As far as Pioneer goes, I would have NEVER recommended them for an SQ head unit even just last summer. And from like 2008 – 2011 I had a fair share of defective Pioneer units. 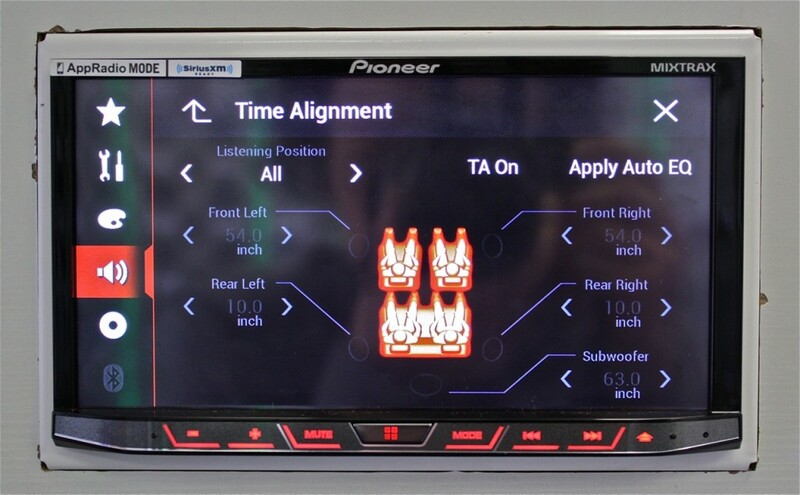 When the App Radio 4 came out in October it was clearly evident that Pioneer made a serious effort to improve sound quality and that same audio processor has been used in the entire NEX line. They are NOT used in any of their other products and the other products are definitely not SQ head units. 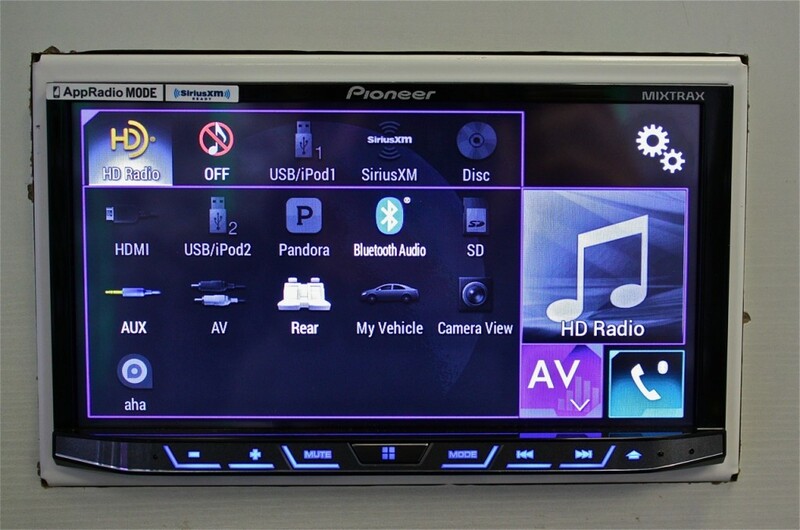 I sell a large majority of other Pioneer models based on features – people really just wanting good Bluetooth, a screen for reverse camera, easy way to play music from their iPod, etc. I also think ease of use is REALLY an important feature for consumers and that is something Pioneer really excels in and Kenwood has not. I get SO many customers that after a couple years come back and tell me they hate their Kenwood, it’s so difficult to use. They get frustrated with it and that impression has stuck with me, I want happy customers, not pissed off customers. A lot of these shops, and we were one of them, focused so much on the sound quality that we could forgive Kenwood for all their other issues, but since then other companies like Pioneer and Sony have stepped up and made quality products that offer sound quality, ease of use and reliability. So we don’t really need to put up with Kenwood’s nonsense just for sound quality. In fact, I think their recently earnings report verifies this. If you mainly plan on playing music from an iPod or cell phone however, I still think the Sony XAV712HD beats everyone hands down. You have to weight out features vs sound quality vs what are the main sources you’ll be listening to. Great reviews. The new Pioneer seems to fit all the needs. I have an question on install and esthetics. I would like to install in a 2015 Forester. I have obtained the JDM trim (the current OEM units are not double din (wider and a tiny bit taller). It protrudes from the dash face ~5mm around the din opening. Have you found that the bottom control “panel” causes any problems in your installs (you made mention of the Sony’s “bottom bar”)? Is there flexiblity to move the unit forward (out) or backward (in) for clearance and elimination of gaps? Thanks for all that you do. Thanks, I’m glad you enjoy the site! Usually these units fit pretty easily in most Japanese vehicles even with typical aftermarket stereo install kits. I guess it would depend on the JDM trim kit and how you attach it to the radio. Usually with iso mount it’s a pretty tight, but can still open a motorized face no problem. In some other kits for American cars, like our Jeep, you have to adjust the way the kit fits on the radio and the adjustment is really done more on the plastic kit. It just depends on where you line up the screws on the kit mount. Additionally, in some cars we find we need to file down the kit opening so the face of the radio can cleanly open and close. It really varies from vehicle and head unit, but any adjustment is usually not a big deal, just some minor tweaking. I’ve got a question about the 4100 and the 8100; do you know what the equivalent UK models are? I’ve been on the UK website and they list different models, I was wondering if you knew or would be able to tell which US model corresponded to which UK model. Great website by the way, very interesting, informative and helpful. Looks like the 8100 would be the AVIC-F77DABm and the 4100 would be the AVH-X8700BT. Glad you enjoy the site, thanks! Thanks for your review Annie. Now that the Kenwood DDX9902s is available, have you had a chance to compare it to the 4100NEX? NO I’m sorry I’ve been swamped with work still not even on the display board yet. I was just about to pull the trigger on a Pioneer AVH-X5700BHS unit until I came across your review and ranking the 4100NEX as the #1 unit of 2015. Can you give a brief rundown of the main differences and any cons to the 5700? Thanks so much for the input and reviews. Huge difference in sound quality processor and overall processing speed of the unit, plus the whole Apple CarPlay and Android Auto thing and detachable face. Thanks Annie for another great review. I currently have a Pioneer 4000NEX. Is the 4100 a step up from it in more ways than just the addition of Android Auto? You talk about the screen being a huge improvement over last years models. Does that include the 4000? Thanks! Hey Josh, yes it’s definitely a brighter and more responsive over the 4000. The 4000 is still a great head unit, but they did upgrade the screen on this 4100. Thanks Annie! I think its the latter! Will the PAC TR-7 Universal Trigger Output Module for Video Bypass actually work on the AVH-4100NEX? Do you need to buy a relay with it? I have read that the new heads need to be double pulsed and using a straight relay or the TR-7 may not work. What is the truth? If you plan to use it for video – either the DVD player or the A/V in – then, yes you need to follow this wiring diagram from PAC. If you’re just using it for CarPlay or Android Auto it seems to be fine hooking it up the normal way. I have been unable to make this work on the AVH-4100NEX HU using the diagram provided and programming the steps laid out. If I take the wire off of Pin #30 (ground) and re-attach, it will then work. Only problem is how do I make that happen automatically? Hey Russel, so it sounds like you’ve either got the remote wire incorrect coming from the TR7 (green) to the head unit remote (blue with white stripe) or you don’t have the Red 12 volts constant/switched going from the TR7 to both 86 AND the head unit’s Red 12 volts switched. Great work you’re doing Annie! *Wireless Carplay via wifi as supported by iOS 8.3. *Pinch to zoom a map – I guess this requires a capacitive screen and for Carplay to enable this feature (even the 8100 doesn’t do it). *Inertial list scrolling and map panning via swiping any area of a map (not just the arrow icons) – why does only the 8100 do these in Carplay (for way more $$ than I want to spend). Sure the AppRadio4 also does this but I want HD Radio. *Touch a map location to choose a destination – Pio’s native NAV systems does this, but why not Carplay. Anyway, what’s your thoughts on the importance of these features and whether I’m smokin something thinking that they’ll be part of a unit as nice and nicely-priced as the 4100 any time soon? Good questions! I was also surprised that the pinch and zoom only seemed to work on the App Radio 4 and I don’t have any answer as to why that is, but I’ll try to remember to ask that next time I talked to Pioneer tech support. I don’t know when we’ll see the wireless CarPlay. I think we’ll probably see that first with Alpine’s iLX-007, but it’s whenever Apple feels like approving/releasing that. Maybe this summer? Maybe next year? I wish I had more inside info on that. I don’t think it’s worth jumping to the 4100 just for HD Radio, but then again, I never listen to radio so it’s not a must have feature for me. Sometimes I think buying head units is like shopping for a car or house. It’s hard to find one with every exact feature, color, spec, etc you want unless you order it and build it yourself, you know? Also – I do like the fact that the App Radio 4 comes with a GPS antenna. I don’t know! I guess you have to weigh which features are most important on your list and maybe at least wait to see how Kenwood’s version works. Hi Annie!!! Sooooo because of all of your reviews and comments I ended up buying the 4100nex. I am installing it myself and I am a LITTLE confused. I bout the pac audio rp4-ch11 as I wanted to keep my steering wheel controls. Nor what wires to connect the harness to the head unit wires I need to connect… I’m reading some things say match all wires and colors. And some saying you only use like two or three wires. No worries, we just installed a Pioneer unit the other day in a 2014 Wrangler using the Rp4-CH11 and we were able to re-assign the factory voice button for Siri. And actually I’ve come across a few vehicles where that App and the SWI-CP5 hasn’t worked or let us re-assign buttons, but doing it the old fashioned, manual way with the older interfaces has worked. So it’s really convenient if you have a car it works well with, but I have had a couple Nissans it flat out wouldn’t work well with and I had to swap for a Metra ASWC. SO – no worries – the RP4-CH11 will work fine. Check to make sure you have the latest firmware of your RP4-CH11, should be a little sticker on it that says the revision number. You can find the latest firmware and instructions here although if it doesn’t have the latest firmware you’ll need a PAC updater tool. If you’ve got the latest firmware (you can try with what’s on there, but always a good idea to have latest firmware) refer to page 3 of the install guide which tells you how to manually re-assign buttons. You want “VR” for Voice Recognition in the Pioneer chart. Read this several times before attempting. It’s very confusing. It took me a while to figure it out, but like anything else, once you read it a few times it starts to make sense. It also helps to practice it in your head before you do it or even have someone read it to you while you do it (I’ve helped my hubby with that before while trying to re-assign buttons using a Metra ASWC, I read while he did the steps, took us a while, but we got it). P.S. PAC Audio does have their own tech line (number online or in packaging) and it is open for consumers so if you get stumped give them a call and if you’re nice to them they appreciate it. Whenever I talk to those guys I try to be real pleasant, they field some nasty phone calls from rude installers all day long and they usually appreciate polite, pleasant and cheerful callers.